The location of Parkside Retreat can't be beat! This in-town home is right by the town park and only a short walk to the free shuttle. This spacious 3 bedroom, 2 bath home with Hot Tub and fantastic yard is warm, inviting, and ready for your family to make memories in Crested Butte! The period details in Parkside Retreat are immediately evident when you enter the home. From the mission style hardware to the saltillo tile floors, to the subway tile baths, everything in this home says "comfortable family retreat!" Step inside the home, kick off your shoes, and get ready to relax. The mud room is spacious and inviting with plenty of room for all your outdoor gear including a bike rack! 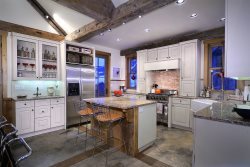 The kitchen is large and open with breakfast seating and plenty of counter space. The 6 burner commercial stove with griddle is great for pancakes and big dinners. Step into the great room with soaring ceilings. The dining room is located in the great room and has an inviting reclaimed table and chairs that are definitely unique. On this level is a bedroom with a King bed and full bath done in period style black and white subway tile. Down the hall you will find the bunk room with two sets of custom log bunks and a great laundry area should you decide to do some chores while on vacation. Off the living room is access to the fantastic outdoor living space with fenced and sprinklered yard, outdoor dining, and of course the oversized private HOT TUB! Back inside the home on the second level is a great junior master suite with queen bed, sitting area, and it's own private deck taking in unobstructed views of Mt. Crested Butte! Also on this level is another period style full bath and a loft area with oversized chair for reading and relaxing. In the winter you are a short walk to the shuttle for fantastic skiing, and in the summer you are right by the town park with play area for the kids, volleyball, horseshoes, baseball, and manicured lawn to just sit back and relax. Unbelievable location and tons of amenities will find you putting Parkside Retreat at the top of your Crested Butte vacation list! Great team and very attentive! Only small nit is that the back screen door needed some attention upon our arrival but it functioned properly and not a big deal at all. Otherwise excellent property and the Iron Horse team was great! Thanks and see you next year!! When we called due an issue with a leak that ocurred, the response was immediate, the staff member was pleasant and helpful and resolved the problem quickly and efficiently. The property exceeded our expectations in every way and contributed to a wonderful and memorable vacation for our family. Thank you so much! We hope to be back to Crested Butte again sometime soon! LOVED IT!! This was our first time in CB and this property MADE our trip!!! It is EXCELLENT!!! So warm and cozy. Felt like we were at home! It was just me and my wife but the place is HUGE! We could have easily invited several other couples to join us. Lots of room. Great ammenities. And GREAT location! We didn't have a rental car and didn't need one (we were there in Feb for skiing). We could walk to main street or the ski shuttle in 5 minutes. Loved, loved, loved this place. Will be going back next year!! Great house! Great town! Great skiing! Great memories!! Iron Horse - We actually had to call a couple of times while we were there and the response was quick and resolved all of our questions. No issues whatsoever. Thank you so much for letting us stay in your house. It's beautiful and the skiing is great here! We love the Secret Stash and the whole family can't wait to come back! House is great, hot tub was very superb after playing in snow!!! Thank you very much!! We will definately be back with all our family!!! Thank you so much! Very helpful and very hospitality!!!! Well stocked, clean, and excellent location. We loved it. Thanks! fit our needs perfectly. Great location. Plenty of room for the 8 of us. Comfortable Beds, great kitchen. Very happy that the house was nicer than than it appeared. Very thrilled with the supplies and selection of pots, baking pans, etc. in the kitchen. It was a perfect house for our family to gather in. Steve was pleasant and very helpful. This home was more than we asked for in every way. The house was beautiful, the furnishings were lovely, the kitchen had everything you need for the making of delicious meals. The yard is beautiful. The hot tub was clean and relaxing. The pictures do not do this home justice for its beauty, comfort and spaciousness. It is located across from the park. It was a perfect place for us to be to attend the Alpenglow Concert Series, to walk to the downtown action, and to drive to breath-taking hiking and biking. Overall this home exceeded our expectations in everyway. I hope to return soon. Clean. Huge. Modern. Comfortable. Well equipped. Great location. We stayed during a family vacation and couldn't have found a more perfect home to stay in. Also, the Iron Horse Property Management was very responsive to all of our questions. I would re-rent this property without hesitation! Visited this location the week of Thanksgiving. We had great family time. Perfect location to town grocery store and restraunts. Lovely vacation spot. Thank you for the opportunity to stay at your home. Would stay again if we make it back that way again. Highly recommend the place. Well stocked with everything you could need. Walk to town and 5 min from the slope. Great layout for a group, comfortable and an easy walk into town. Would stay here again! The staff was always friendly and helpful. The communication for the property was top notch. Everything we needed was anticipated and communicated even before we asked. It made our trip planning simple. This property exceeded our expectations. The house was beautiful, well maintained, and comfortable. It provided a lovely setting for our small family get together. The park across the street was a bonus for us. We watched the Perseids on the upstairs balcony. Some of us used the hot tub which was beautifully placed in the park-like setting of the back yard. I hope to return next year. Steve was pleasant and very helpful. Very happy that the house was nicer than than it appeared. Very thrilled with the supplies and selection of pots, baking pans, etc. in the kitchen. It was a perfect house for our family to gather in. It fit our needs perfectly. Great location. Plenty of room for the 8 of us. Comfortable Beds, great kitchen. Great house!! Well stocked, clean, and excellent location. We loved it. Thanks! Steve Ryan is the best! Thank you so much! Very helpful and very hospitality!!!! It was awesome!!!! House is great, hot tub was very superb after playing in snow!!! Thank you very much!! We will definately be back with all our family!!! Great location and it met all of our needs.